On September 9th, 2017 at 10:00 AM Central Time, Ski-Doo unveiled its all new RS race sled – the 2018 Ski-Doo MXZx 600RS E-TEC . 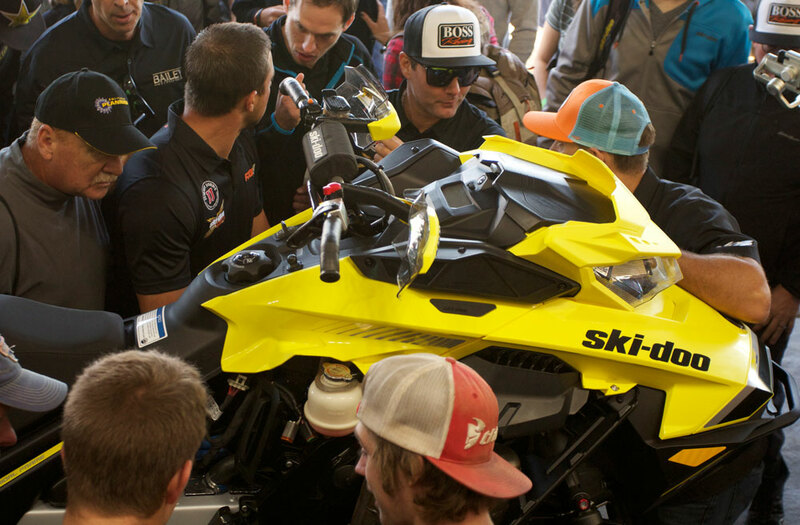 Steve Cowing, public relations manager for Ski-Doo, along with Carl Kuster, former snocross and hillcross racer, pulled the cover off the all new 2018 Ski-Doo MXZx 600RS E-TEC during the 51st annual Hay Days event. 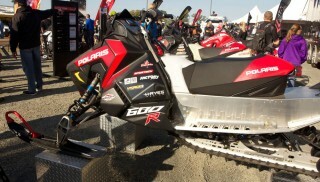 “The only part on this sled that is the same as last year, is the track,” says Cowing. Spectators watched in silence as they were told about the new sled. 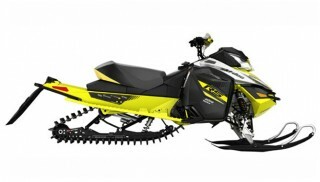 The 2018 Ski-Doo MXZx 600RS front end appears Summit like with Summit plastics. 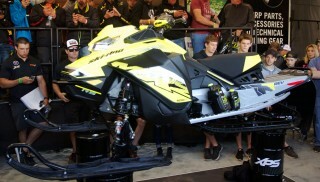 Ski-Doo built the race sled on the Gen4 platform for superior rider ergonomics and handling in rough riding conditions. The 2018 MXZx 600RS E-TEC features Summit plastic. Perhaps the most exciting news was the new E-TEC engine is direct injected. The fans were probably the most excited with Direct Injection (DI) for the race sled. Racers and mechanics alike were probably counting the hours they would save not adjusting carburetors. The new motor has been completely reconfigured to fit in the REV Gen4 platform. 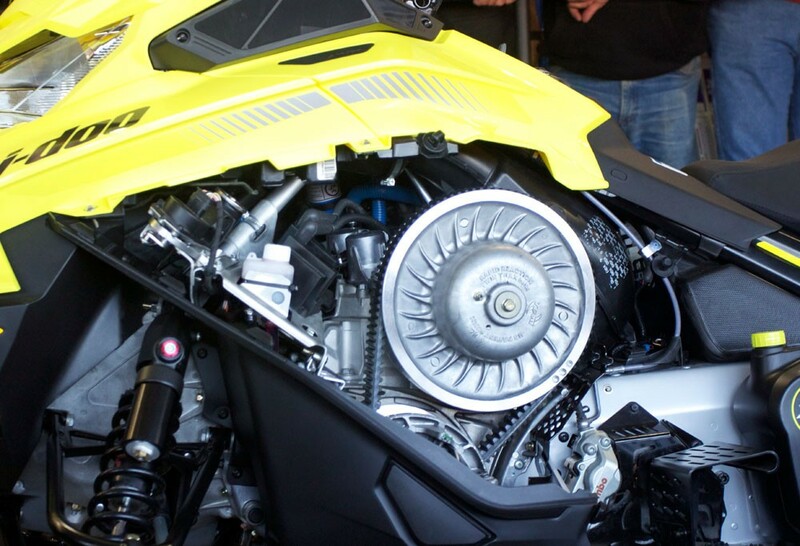 With all this horsepower, Ski-Doo also felt its racers would need a new brake. The Brembo dual brake caliper has been improved and mated with a stainless steel rotor to deliver immediate, precise, consistent braking power, and is loaded with new pads. 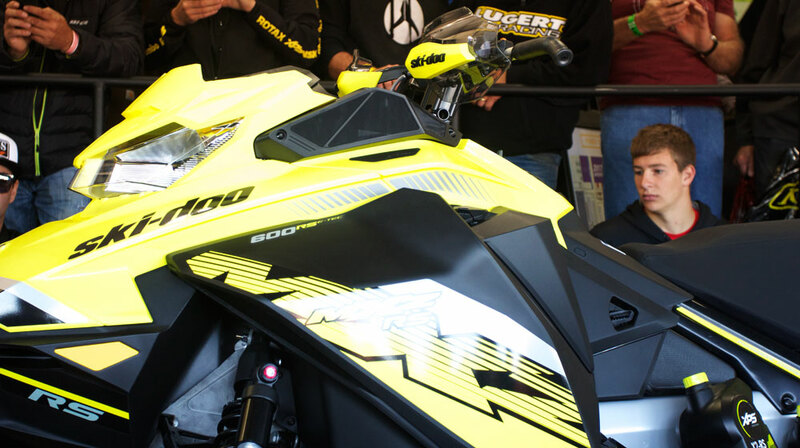 Race fans get and up close and personal look at the new 2018 Ski-Doo MXZx 600RS E-TEC. The KYB PRO 40R shock will take the brunt of abuse during a race. To compliment the RS’s all new pre-mix direct injection, E-Tec engine, Ski-Doo also introduces its X2-RS full synthetic oil. 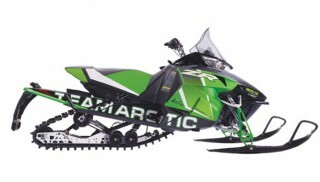 All racing snowmobiles experience extreme load conditions, at high RPMs, at extreme temperatures. This new full synthetic oil is designed with a higher viscosity base, using their unique to XPS additive package for all race engines, maximizing power and throttle response. By reading these facts alone the MXZx stacks up to be a formidable opponent on the track. Now the ultimate test will come this year when racers pound it out on the track.